Microsoft Outlook has now become a platform, which is helping multiple organizations for the maintenance of their work. It comes up with a very attractive feature suite and is useful for executing cross-communication. However, increasing size of Outlook files generally has a negative consequence on Microsoft Outlook. It makes the performance of Outlook sluggish and sometimes it starts freezing as well. To avoid this, there is a need to compact Outlook OST file. The process to Compress OST File enables users to utilize the extra space that is commonly available in MS Exchange OST file. We will come to the strategy for the same, but let us first discuss a very interesting and essential fact about white space in Microsoft Outlook. It is the fact that any kind of deletion never removes the emails, contacts & other things from the mailbox. Whether it is a soft deletion or hard deletion, it is not possible to empty the space completely. In fact, such deletion only makes the data invisible. This means users cannot view or read it. Even a permanent elimination of items generates a “white space”. Microsoft Outlook is designed in a way that it brings an inbuilt option of “Compact Now”. 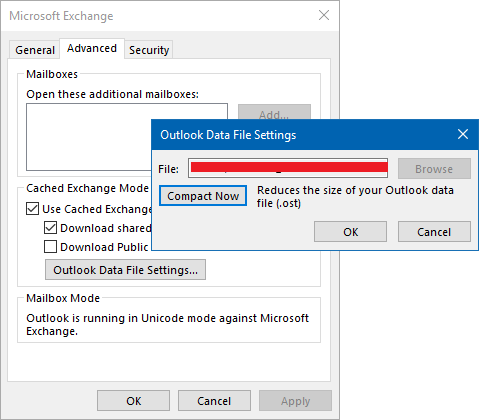 With the help of this option, users can lessen the size of Outlook files. However, while using Microsoft Exchange, it requires some additional clicks for the accomplishment of the task. Users need to follow different steps according to the versions of Outlook to compact OST file. In this digital arena, every business needs a useful platform for the storage and exchange of data. Microsoft Outlook is one of the crucial platforms for the same. Generally, it stores the data PST format while in synchronization with Exchange, it creates OST file. With OST file, users can access the data in offline mode as well. However, as discussed above with the increasing size of OST or mailbox many problems can occur. Therefore, considering this we have come up with the proper solution to compact OST file size. With this, users can manage the size of OST easily and avoid problems of Outlook.